If you like this e-zine , please do a friend and me a big favor and "pay it forward" by sharing it with them. It's hard to believe, but here we are at the end of the first month of this new year. This is numbered as the second installment of the Discoverer newsletter, but the first one really was sent out by mistake as I was feeling my way around the publishing software. I intend to send future editions of the e-zine at the end of each month. I'll be keeping you informed and up to date on interesting events coming up in Central California as well as giving you previews of pages I've yet to build on the site. Generally, I have a list of topics about which I'll be writing and then as I'm out and about in the area, I'll take the photos needed for the page. So, I have the photos before I publish the pages and I'll share some of them with you here. That way you can see the coming attractions, as it were. 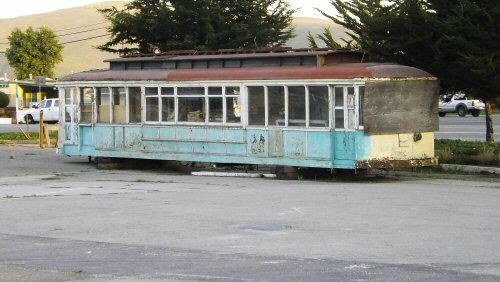 The photo above of an old, dilapidated street car was taken recently in Morro Bay. I got quite excited when I passed by the intersection where this old thing was located since there is an interesting history behind it. It started out life in the early 1900's as a streetcar in southern California, then was retired and moved to Buellton, near Solvang where it, and its companion, were made into a classic roadside diner off Highway 101. It lived there for probably 70 years until last year, when the land was sold. The old diner was closed for many years, but it spoke of an earlier California and was missed when it was gone. Now the diner cars have re-surfaced in Morro Bay and hopefully the new owner will be doing something fun and creative with them soon. The help I need is that a story like this (and I do intend to tell it on my site), doesn't really fit into any of the categories I already have. The sign says it all except where...and that is at the Pismo State Beach Monarch Butterfly Grove. Right on Highway 1 at the very southern end of Pismo Beach. The monarchs are there (last count was about 28,000 of them), but won't be for long. Toward the middle to end of February they will start heading north again and won't be back until October (at least their great-grandchildren will be back). 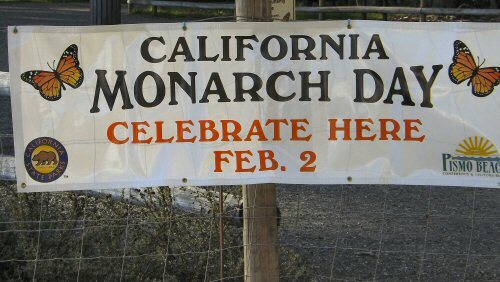 Make plans to be there on Monarch Day or sometime soon. I took this photo at the end of last year on Cholame Valley Road, which joins with Highway 46 in eastern San Luis Obispo County. 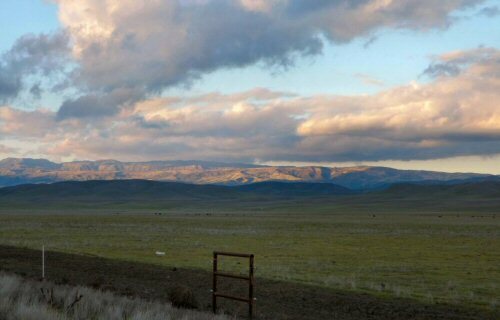 The Jack Ranch is owned by the Hearst Corporation and is quite large, 100,000 acres. It is one of the easternmost of the old Spanish and Mexican land grants in the area. This road leads eventually to the little burg of Parkfield.